"New Functionalities on GST Portal - Volume 2"
After the day of live streaming, the webinar recording will also be available at You Tube Channel of Goods and Services Tax Network. 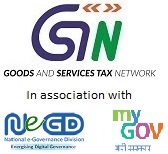 For viewing all previous webinars recordings and other useful application videos, YouTube channel of GSTN may be accessed either by clicking at the You Tube icon given at the homepage of GST website or through the link given below. "E way Bill Updates with Live Demo"
"New Features in Form GSTR3B Filing", in Tamil Language.